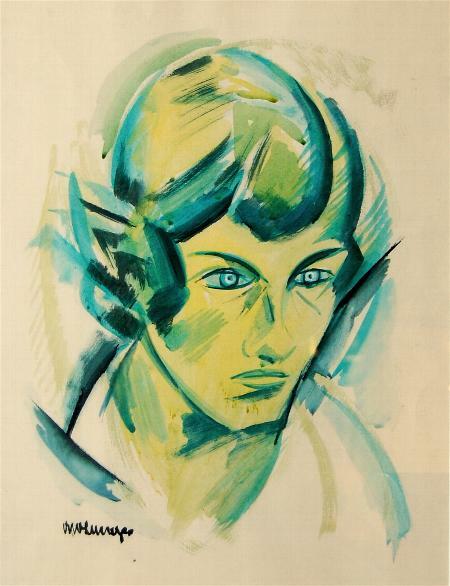 „Mädchenbildnis“ (Portrait of a girl), 1920ies, watercolor on paper. Signed in the lower left corner „OttoLange“. Lange is known for his mastership in expressive woodcut prints. Aquarelle and especially portraits are extremely rare in his oeuvre. 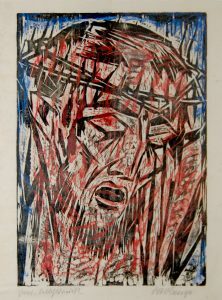 Please compare to the woodcut „Head of Christ“ in the section „Graphic and Prints“. It seems as if Lange used the same basic facial composition for both works. Also in the collection: „Head of Christ“, 1916.
followed by studies at the Art academy Dresden as master student of Otto Gussmann. After receiving the great Saxonian State Award, he was appointed teacher at the Royal Prussian School of Applied Art in Bromberg (today Poland). In 1919 he returned to Dresden and became, together with Otto Dix , Conrad Felixmueller, Otto Schubert and Lasar Segall, cofounder of the „Dresdner Sezession Gruppe 1919“. Lange was appointed Professor for textile design in Plauen. He lost his professorship in 1933 and 77 of his works were confiscated in the campaign „degenerate art“. Two of his works were shown at the „Degenerated Art“ travelling exhibition in 1938. Lange died in 1944 due to an infection after an operation.